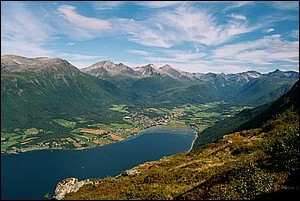 Thousands of impressed visitors drive through the Romsdal valley each year. 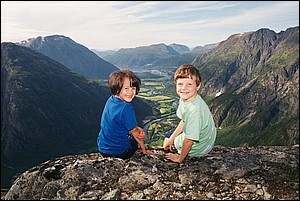 Few knows this wild corner of Norway is ideal for kids like us. We made it up here and so can you. Take a look at our mum's pictorial guide to family mountaineering in Romsdal ! Wild? You bet! Inaccessible? Not at all! 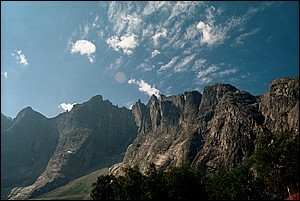 These peaks offer a wide range of exciting walks for the whole family. Maps, descriptions and pictures from walks to Bispevannet (Trollstigen), Trolltindene, Vengedalen/Litjefjellet, Mardalsfossen, and Øverdalen. 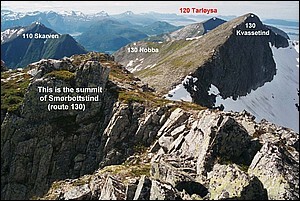 We have a cabin in this remote valley called Skorgedalen, and these routes are literally on our doorstep. Maps, descriptions and pictures from walks to Skorgehaugen, Strandafjellet, Skarven, Tarløysa, and Smørbotten. Isfjorden (left) and a few more pictures from Romsdalen.